Sometimes, despite your best efforts to eat right and stay fit, you may not see the toned, flat abdomen you’ve worked so hard for. Women who have given birth have a unique set of challenges to obtain a firm tummy. In situations like these, a tummy tuck can help you achieve a youthful, attractive abdominal area. If you are unhappy with the appearance of your tummy and would like to learn more about tummy tuck surgery, please contact Richard H. Lee, MD Plastic Surgery online or at 949-548-9312 today to schedule a complimentary consultation. Our board-certified plastic surgeon helps patients from throughout California, including Newport Beach, Irvine, Santa Ana, Orange County and the Greater Los Angeles area. Why Choose Dr. Lee for Your Abdominoplasty? The procedure can firm and strengthen your midsection while enhancing the contours of your waist and hips. The most apparent benefit of abdominoplasty is the slim, flat midsection the procedure creates. A more toned belly can help to provide a more balanced look to your entire figure. These surgical enhancements can include the general toning of the abdomen, the elimination of stretch marks and the removal of loose and sagging skin. Many patients seek the procedure for the aesthetic benefits, but soon discover a wealth of physical benefits as well. In addition to removing excess fat and skin during abdominoplasty surgery, Dr. Lee also tightens the abdominal muscles. By doing so, he not only draws in the waist, he tones and strengthens the core, which improves physical balance and function. Abdominoplasty alone may not completely improve your core strength, but it can establish a foundation for a more active lifestyle which can more easily enhance your appearance and overall quality of life. If there is an aspect of your tummy’s appearance that you are dissatisfied with, our experienced tummy tuck surgeon Dr. Lee may be able to help you achieve your desired outcome with abdominoplasty. Schedule your free consultation in Newport Beach today. While tummy tucks offer many patients beautiful, beneficial results, the procedure is not right for everyone. Your current health and lifestyle play a large role in your candidacy for the procedure. Abdominoplasty is not a weight loss surgery. The best way to know if you are a good candidate for tummy tuck surgery is to meet personally with Dr. Lee in a confidential consultation. During this personal one-on-one-meeting, Dr. Lee will work to understand your goals and answer your questions. He will evaluate your physical condition and determine if abdominoplasty is right for you. Dr. Lee understands what an important decision it is to undergo cosmetic surgery. This is your procedure and your choice. He will never pressure you or rush you into making a decision. Instead, he will serve as your guide and mentor to ensure you understand all of your treatment options and what to expect from the surgery. If you are not currently at your ideal weight, Dr. Lee may recommend postponing the surgery until you get closer to your target weight. Full tummy tuck: Full tummy tucks are designed to tighten the entire abdomen from the ribs to the pelvis. Incisions typically extend from hip to hip. This incision is discreetly hidden beneath most types of undergarments and bathing suits. If you have extra fat and skin both above and below your belly button, this technique may be your best option. Mini tummy tuck: If you have only a modest amount of excess fat and skin that is isolated below your belly button, you may be a good candidate for a mini tummy tuck. While mini tummy tucks offer the benefits of a shorter scar and quicker recovery time, the procedure is limited in what it can accomplish and only appropriate for a small percentage of patients. During tummy tuck procedures, Dr. Lee typically includes liposuction of the flanks and abdomen. He also takes time to ensure your belly button is attractive and looks as though it has never been touched. A tummy tuck is a complex surgical procedure. Before your surgery, Dr. Lee will provide you with detailed instructions on how to prepare for your surgery and what to expect. Depending on the complexity of your procedure, he may advise you to stay overnight in the hospital so that you can be closely monitored. Following your surgery, your abdomen will be bandaged with gauze pads and an abdominal binder. These will be left on for 48 hours after you’ve returned home. Then, you may remove the dressings and abdominal binder and get in the shower. You may remove the yellow gauze from your belly button as well as any drains. Leave your Steri-strips (surgical tape along the incision line) on while you shower. After showering, pat your incision dry and wrap your midsection with the abdominal binder. If you notice signs of drainage on the abdominal binder, place a clean piece of gauze on the incision line and wrap the abdominal binder over the gauze. You should not swim or bathe for at least two to three weeks, but showering is fine. Over the course of the next few weeks, it will be important to follow Dr. Lee’s post-operative instructions closely. You can expect some discomfort during your recovery, but Dr. Lee will prescribe medications to help you feel more comfortable throughout the healing process. You may notice that the skin around your abdominal is numb, but sensation should return over the next few months. Although full recovery does take a few months, you should be able to return to work and your everyday activities in about three weeks. During your recovery, Dr. Lee encourages you to contact him whenever you have a question or concern. He is available through his office phone 24/7. 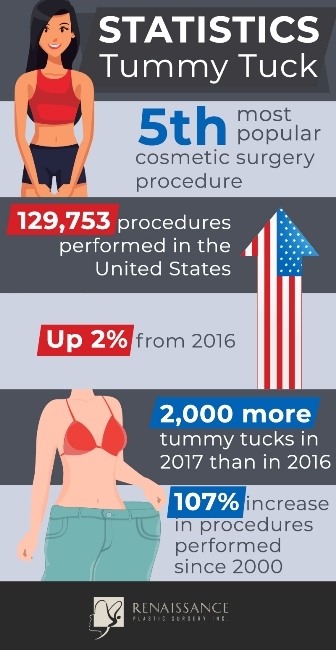 The cost of tummy tucks varies from patient to patient, depending on the type of abdominoplasty performed and the extent of work needed. Costs can include a number of things, such as anesthesia fees and whether or not you need to stay overnight in the hospital. While you may be inclined to shop around for the best price, it’s crucial to understand the importance of choosing the right tummy tuck surgeon for your procedure. Cheaper is not always better. The experience, skill and track record of your surgeon are essential factors in determining who you should trust to perform your surgery. Choosing a physician who is not a board-certified plastic surgeon and who may not have performed tummy tucks on a regular basis can be detrimental to your results and safety. Dr. Lee is a board-certified plastic surgeon, certified by the American Board of Plastic Surgery. He has more than 15 years of surgical experience and reputation for providing exceptional results. We invite you to visit our before and after gallery to see his beautiful, natural-looking results for yourself. In addition to Dr. Lee’s outstanding credentials and results, he performs surgical procedures at an on-site, AAAHC-accredited surgical facility. This distinguished accreditation by the Accreditation Association for Ambulatory Health Care (AAAHC) can assure you that you are receiving the highest levels of comfort and safety for your surgical procedure. You don’t have to live with an unsightly, protruding abdomen. To find out if you are a good candidate for tummy tuck surgery, please contact Richard H. Lee, MD Plastic Surgery today by completing the form on this page or calling 949-548-9312 to schedule a complimentary consultation with Dr. Lee. We serve patients from throughout California, including Newport Beach, Irvine, Santa Ana, Orange County and the Greater Los Angeles area.